This shawl was finished over a month ago, and it’s been in use every evening, but I hadn’t had a chance to take proper pictures yet. It’s proving very difficult to take indoors pictures with enough natural light now that I live in a ground floor flat, and it’s been so cold (and increasingly so) that it takes some motivation to go outside with the tripod. Not to mention the neighbours that, er, might find me a little weird. It actually snowed here yesterday morning (a few hours before the pictures were taken), so these pictures took some dedication. I also took pictures of another finished object, but wasn’t plucky enough to photograph my latest Jalie top. We’ve been having an absurdly cold autumn here! Isabelle, it's gorgeous! It snowed here yesterday too, with more forecast for this week – brrr! 😉 J'adore ton châle, et j'adore aussi les légendes de tes photos ! The shawl is really nice too! 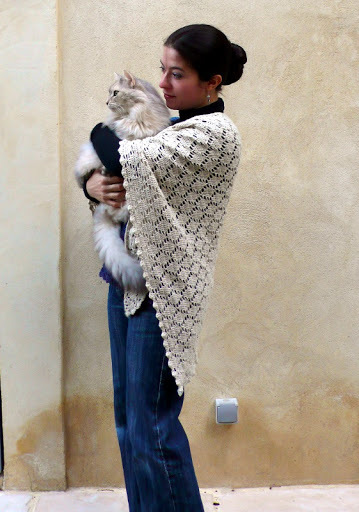 Gorgeous shawl and lovely to see piccies of your beautiful kitty! Un sentiment de honte m'envahit en voyant cela et en passant à mon blog à l'abandon. Pourtant j'ai refait mon couture de A à Z ce WE en plus, en ré-encaustiquant même le parquet ! My cat demands to go out too, but then rushes back in as soon as he realizes the real temperature.. My only problem is that he insists on checking that it's as cold when he goes out the front door as when he goes out the balcony. Sigh. At least you can both snuggle into that lovely shawl :-). 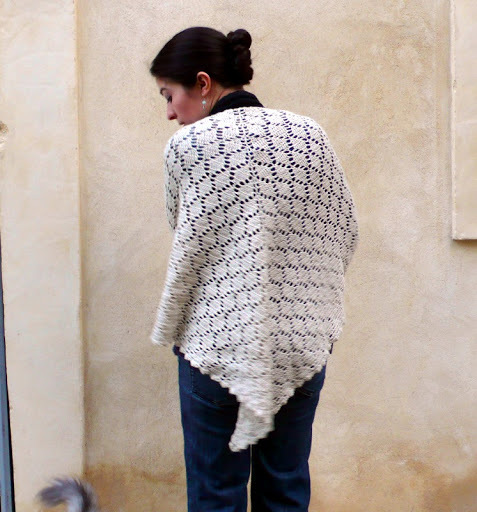 Gorgeous shawl. And very cute cat video! What a lovely kitty Little Cutie is! 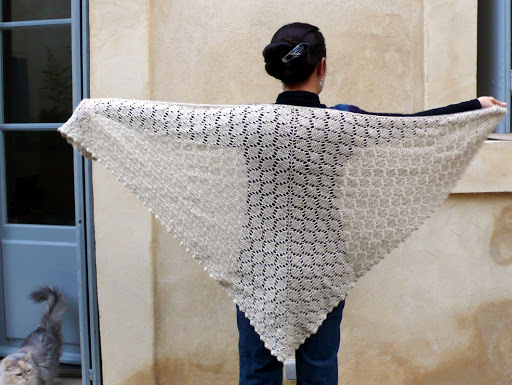 Beautiful shawl. Your posts make me want to seriously take up crochet. Have a good week. Magnifique ton châle … chez nous, il neige ! Gros bisous tout gelés ! Wow, that is so cold! We've been having erratic weather here, but it hasn't settled into super cold for very long at a time. I think the reprieve is coming to an end soon, though. That's gorgeous and what beautiful pictures you managed to take, well worth the effort!